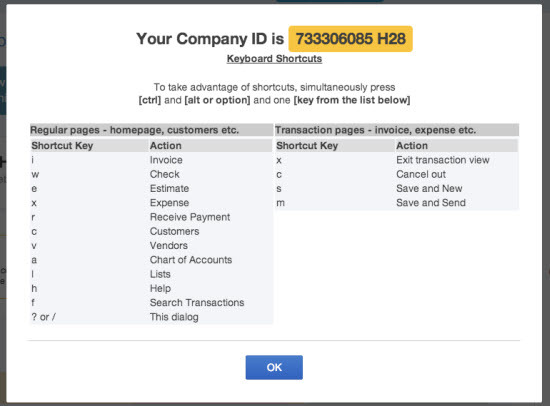 There are several shortcuts that can speed up the navigation within QuickBooks Online (QBO). These will all work in IE, Firefox and Chrome except where noted. Microsoft has a nice page of shortcuts on its IE10 website at https://support.microsoft.com/en-us/products/windows?os=windows-10 (click Show all). Note to Mac users: You can try these shortcuts using the CMD key instead of Alt or CTRL when noted below. Also, see our KnowledgeBase article Will I notice any differences when using QuickBooks Online with Safari vs. other browsers? for more details about Mac keyboard shortcuts. You can now download a QuickBooks Onilne Keyboard Shortcuts reference guide that can be printed for your convenience. QuickBooks Online Keyboard Shortcuts For PC Users reference guide. QuickBooks Online Keyboard Shortcuts For Mac Users reference guide. A quick reference guide for commonly accessed screens can be accessed directly within QuickBooks Online. CTRL + F works in IE, Firefox and Chrome. Internet Explorer will bring up a pop-up window to do the search. Firefox opens a Find toolbar on the bottom of your screen, while Chrome opens a search field at the top right of the screen. Space Bar to check a check box field. From any form, press Alt + S instead of clicking Save. In Firefox and Chrome, you must use Alt + Shift + S. For Mac users it is Option + Control + S.
Press – to decrease the Ref #. Press Alt + S to save. Alt + Shift + S in Firefox and Chrome. Select the Vertical or Horizontal field, and then press “+” to raise the number or ” – ” to lower it. You must use the keys on the numeric keypad.